Saving and fun come together in this printed puzzle money box. 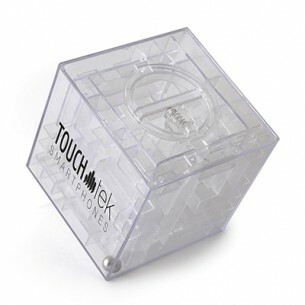 This unique promotional item consists of a small cube that contains a maze inside, while a slot in the top allows coins to be inserted. What's more, you can only open the box when the puzzle is solved. A great 2-in-1 branded gift idea, this would be an appropriate gift for any finance-related business.